As November has passed us by, so has Movember. 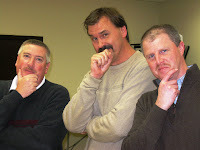 And what might Movember be? Movember has been described as the male version of the Susan G. Komen effort to raise money and awareness for cancer. Men who participate shave on October 31st and then grow mustaches throughout the month of November. Caring friends, family, and coworkers can give a tax deductible contribution to help cure prostate and testicular cancer. Organizations that benefit include LIVESTRONG and the Prostate Cancer Foundation. As of last year, 1 in 6 men were diagnosed with prostate cancer in their lifetime and 1 man died every 18 minutes of prostate cancer. Please help Spectrum Industries to put a dent in this horrible statistic and consider contributing to the Spectrum Movember team at http://us.movember.com/mospace/775946/ From this year’s participants, both in Movember and Relay for Life, we at Spectrum thank you!